Simplify your contracting business, and grow sales. The SalesRabbit cloud-based platform and app is the best sales tool for in home contractors! Our team at SalesRabbit understands how difficult it is to keep track of leads, success rates of your individual sales reps, and job assignments. With our software, managers can quickly map out homes for bid, and delegate those areas to their sales reps or job developers. This contracting software is a mobile app for contracting companies whose reps, managers, and workers are on-the-go. SalesRabbit’s sales mapping software allows managers to check in on reps’ and workers location and progress at any point of the day. Managers can update assignments, and sync information with the entire team for maximum efficiency. All of this happens from a mobile device, meaning managers and reps can monitor company activity from anywhere! Sales Reps love SalesRabbit as much as managers! SalesRabbit offers the best sales tracking software options for connecting your team. The mobile app and platform allow reps to quickly input where they have gone, who they have reached out to, and what services they have discussed with potential customers. All of this information is then instantly synced with the home office or other reps. 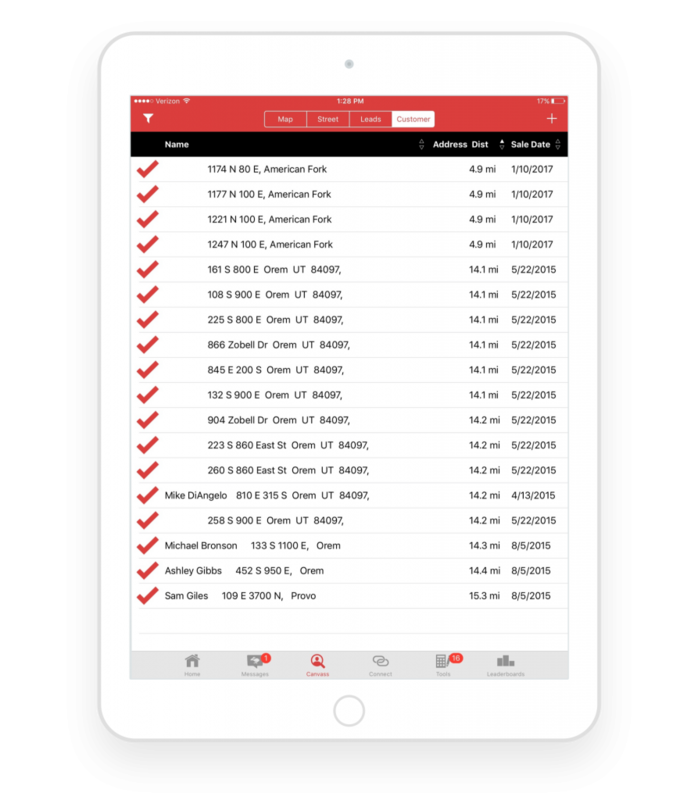 The powerful features of our sales tools app also enhances reps’ face-to-face interactions with customers by serving as a library of all their sales and presentation materials. SalesRabbit can also be branded to fit your company. This boosts rep credibility when customers recognize that the company has an app geared specifically towards their business. As the best sales app in the market, SalesRabbit simplifies company management and project communication for your company. Increase your sales rates by maximizing team efficiency! More Contractors have started using Sales Rabbit to increase sales than any other sales lead tracking software in the industry. With 3rd-party integration, Sales are much easier for you and your team.